The PTT test checks the PTT blood level. What is a PTT test? The PTT blood test, or PTT lab test, measures the PTT blood level. Why is a PTT blood test important? The PTT test is measures the partial thromboplastin time to help manage warfarin and medication dosing and screen for clotting disorders. This PTT Test is a blood test. The PTT test, also known as a partial thromboplastin time test, PTT blood test, and PTT lab test, measures the PTT blood level. To get a PTT test near you, simply order online and get tested at a local lab. Every standard Quest Diagnostics lab near you should be able to perform the PTT test as it uses standard equipment. 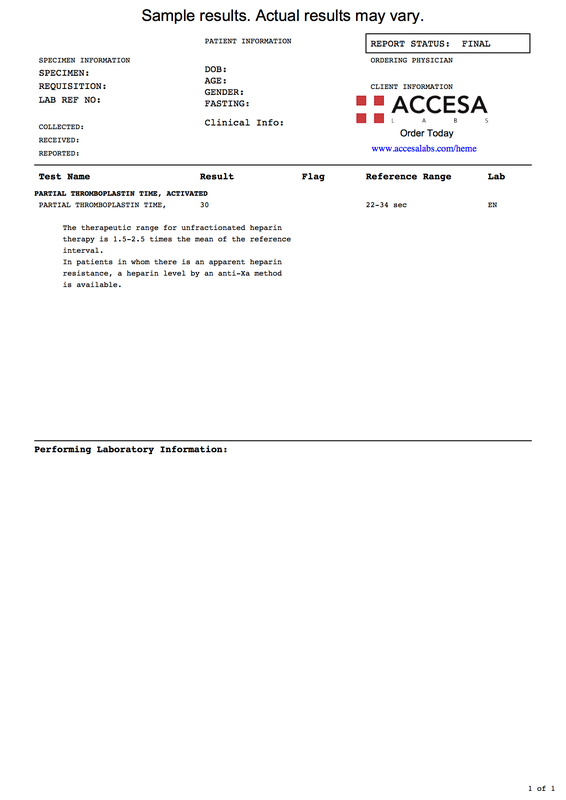 As can be seen on the PTT sample report above, the lab result will be reported in seconds which can be compared against the PTT reference range provided by the lab. PTT Test at Guaranteed Prices.